Walton Introduced Country’s First Computer Factory 2018. 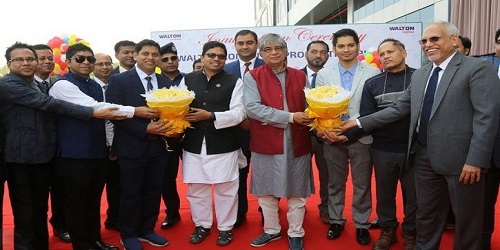 Walton Our country’s leading electrical, electronics and home appliances manufacturing and marketing company, has officially inaugurated an computer factory in Gazipur, emerging the country’s first computer manufacturing factory. Walton DG-TECH Industries has been inaugurated last month at Chandra in Gazipur. ICT Minster inaugurated the opening ceremony. Through that debuted the country’s first computer manufacturer factory. On last January 2018, Walton Computer factory was inaugurated by Mr. Mustafa Jabbar, the Minister for post, telecommunications and information technology and State Minister for Information and Communication Technology Junaid Ahmed Palak. Walton has everything needs to be a hi- tech park. Minister Mustafa Jabbar said, Walton will get all the benefits of Hi- tech Park if they apply for. He also said that Walton is making two-layer motherboard in Walton factory. Walton has announced the plan to make multi-cellular motherboard within this year. Walton will move forward in producing other computer accessories like pen drive, key-board and mouse gradually in their factory. After inauguration of Walton’s newly built computer factory, Junaid Ahmed Palak said, “Walton has set up a computer factory in Bangladesh. This is a great initiative. We welcome this initiative. Speaking about government’s cooperation in the hardware sector, he said, “It is a courageous initiative but a initiative is not enough, the government’s cooperation is needed for success. We went to watch different production lines in Walton, we never imagined such an ultramodern production and assembly line. Walton made so many impossible things as possible. Initially production target of the factory has been fixed for 60,000 units of laptop, 30,000 units of desktop and 30,000 units of monitor. Along with the other accessories of the computer, Walton will be able to produce pen drive, keyboard and mouse. Intel’s last-generation processor laptop is going to be made in Walton’s factory. Walton Desktop and Monitor will be producing affordable models of affordable models. In the meantime, high quality PCBAs or motherboards have been started by installing the S2 root2 pins on the PCB (printed circuit board) through the SMT (Surface Mounting Technology) system. Enhanced stock of required raw materials has been raised. One thousand people are employed in Walton Computer Factory. Walton High-Tech Industries Limited Chairman SM Shamsul Alam and Managing Director SM Ashraful Alam, Walton Digitech Industries Ltd Chairman SM Rezaul Alam and Managing Director SM Manjurul Alam were present among others. At the inauguration ceremony, Walton authorities have said that modern Japanese and German tech machinaries have been installed in the computer production unit of Walton DG-TECH Industries at Chandra in Gazipur. Laptops and computer design developments, research and development departments, standard control departments and testing labs have been developed here. After the inauguration of this factory, Bangladesh added it’s name to the list of computer-producing countries after the smartphone. A new history of the country’s IT manufacturing sector made, a new skyline of technology sector was opened.